To investigate the detection rate of pulmonary nodules in ultralow-dose CT acquisitions. In this lung phantom study, 232 nodules (115 solid, 117 ground-glass) of different sizes were randomly distributed in a lung phantom in 60 different arrangements. Every arrangement was acquired once with standard radiation dose (100 kVp, 100 references mAs) and once with ultralow radiation dose (80 kVp, 6 mAs). Iterative reconstruction was used with optimized kernels: I30 for ultralow-dose, I70 for standard dose and I50 for CAD. Six radiologists examined the axial 1-mm stack for solid and ground-glass nodules. During a second and third step, three radiologists used maximum intensity projection (MIPs), finally checking with computer-assisted detection (CAD), while the others first used CAD, finally checking with the MIPs. The detection rate was 95.5 % with standard dose (DLP 126 mGy*cm) and 93.3 % with ultralow-dose (DLP: 9 mGy*cm). The additional use of either MIP reconstructions or CAD software could compensate for this difference. A combination of both MIP reconstructions and CAD software resulted in a maximum detection rate of 97.5 % with ultralow-dose. 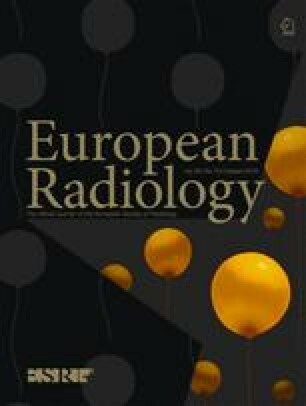 Lung cancer screening with ultralow-dose CT using the same radiation dose as a conventional chest X-ray is feasible. • 93.3 % of all lung nodules were detected with ultralow-dose CT.
• A sensitivity of 97.5 % is possible with additional image post-processing. • The radiation dose is comparable to a standard radiography in two planes. • Lung cancer screening with ultralow-dose CT is feasible. An erratum to this article can be found at http://dx.doi.org/10.1007/s00330-016-4325-3. The scientific guarantor of this publication is Dr. Andreas Christe. The authors of this manuscript declare no relationships with any companies whose products or services may be related to the subject matter of the article. This study has received funding by the Bernese Cancer League, the Jubilee Foundation Swisslife and the Swiss Fight Against Cancer Foundation. The funders had no role in data collection, study design and analysis, preparation of the manuscript or decision to publish. One of the authors has significant statistical expertise. Institutional Review Board approval was not required because this was a phantom study. No study subjects or cohorts have been previously reported. Methodology: prospective, experimental, performed at one institution.